Can we define time-structures for cinema and particularly expanded cinema that go beyond narrative? Or if not beyond it: around, underneath, across? The works in “Movable Facture: Time Frames” are drawn from an earlier moment in film’s history, when a preoccupation with structure was attended to through a variety of formal experiments and strategies that skirt or avoid narrative immersion. The selection is drawn from classic structural films such as Hollis Frampton’s Nostalgia, and little-seen local gems found in Pacific Cinémathèque’s West Coast Film Archive. These experimental works are present as film, despite cinema’s potential to bring us toward something else. Eschewing story, they are more closely related through formal features that attempt to draw a viewer toward an unauthorized experience. While we might invest a psychological experience in a representation, we may also spend time with cinema’s problems. Flat fields of movement and sound can offer coherence, but it is not a coherence that belongs with the spectator. Tony Conrad, The Flicker. 1966, 16mm, 30mins, USA. Beverly Conrad, Straight and Narrow. 1970, 16mm, 10mins. USA. Keith Rodan, Cinetude 2. 1969, 16mm, 5mins. Canada. David Rimmer, Variations on a Cellophane Wrapper. 1970, 16mm, 8mins, USA. Paul Sharits, T.O.U.C.H.I.N.G. 1969, 16mm, 12mins, USA. 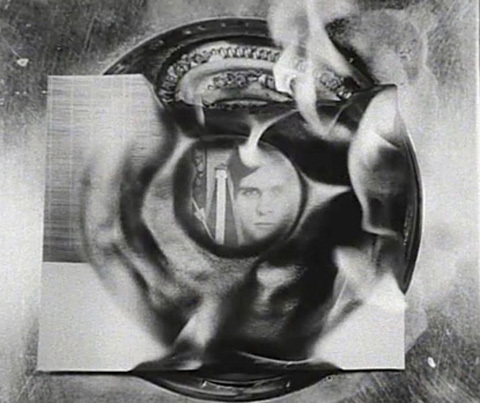 Hollis Frampton, “Hapax Legomena I” (nostalgia). 1971, 16mm, 39mins, USA. “Time Frames” accompanies the exhibition “Movable Facture”, featuring the work of Amy Granat and Drew Heitzler, Isabelle Pauwels, Benjamin Tiven, and Jennifer West, at VIVO Media Arts Centre, June 1-23, 2012. Flicker, Straigh and Narrow, . T.O.U.C.H.I.N.G., and “Hapax Legomena I” (nostalgia) courtesy The Filmmakers Coop.